Tool bags, in various shapes and forms, have been in use since the ancient times. However, modern tool bags are a more compact and handy affair – helping you carry numerous pocket tools with ease and in an organized manner. Nowadays the best tool bags are not only used by tradesmen but also DIY enthusiasts and anyone who needs to carry the tools like wrenches and chisel around. Thinking of buying a new tool pouch and don’t know where to start? Tag along, as we take you through the ABCs of buying the best tool bag for you. How To Choose The Best Tool Bag? 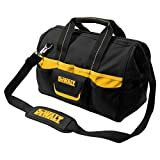 What To Consider When Buying The Best Tool Bags? What Are The Benefits of Using The Best Tool Bag? 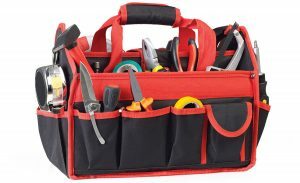 The Klein Tools 554181914 Electrician’s Bag is a great storage option for carrying your pro tool like pliers and screwdrivers around. Its 55 pockets and a sturdy design make it an ultimate storage solution for tool storage, or even as a tool backpack. It is the best tool bag for plumbers, or carpenters, or pretty much any professional. Oh, did we mention that you get lock bars for keeping the bag wide open, as well as two separate meter pockets? The VETO PRO PAC OT-XL Tool Bag can accommodate an astonishing 80 tools and gears in its 44 pockets and compartments. Its ergonomic design impresses too – with padded straps, handles, and a waterproof base, which makes it the best tool bag for the carpenter for carrying tools like a cordless drill and saws. With heavy duty zippers and lots of space, this is an almost perfect toolbag for any handyman and a great replacement for such belts like tool belts. When you’re buying a tool bag, think not only of your current tools but make it future-proof. For example, for the best tool bag for the carpenter, make a note of how many tools you might need to carry around in the coming days, and buy a size that can accommodate them. Weight is a major issue when it comes to tool bags. Tool bags are in principle designed to be carried around, so it doesn’t make much sense to buy one that weighs a ton, right? Go for a bag that is lightweight enough to carry around but still durable. Importantly, also look for the weight limit of the bag, as in how much can it carry without putting stress on the material. As far as durability is concerned, avoid materials that feel weak or very thin. The market standard is nylon or canvas with plastic materials used in linings. Also, choose a bag with heavy-duty zippers, stitching, and carrying straps if you want your bag to last longer through everyday use. To utilize the most out of any tool bag, make sure it comes with lots of compartments for easy organization, which differentiates sit from a tool belt. The more the pockets and pouches in a tool case, the better! Expensive does not always mean quality when it comes to tool bags. You can get a lot of value for reasonably priced tool bags if you look into the market well enough. Even though the best tool bags are essentially used roughly and in abandon, that doesn’t mean it should be a hideous piece of thing to carry around! You can find a lot of sleek-looking, stylish tool bags in the market that are both practical and durable. 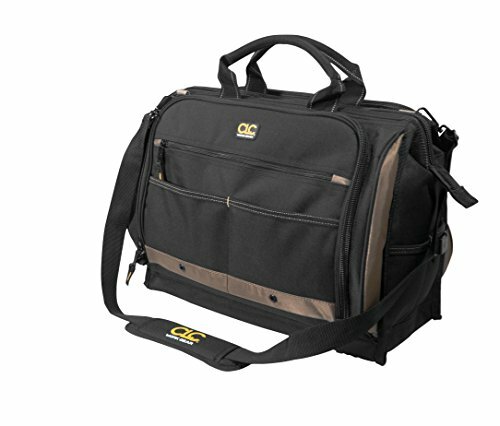 Compared to universal tool bags, profession-specific bags can be more useful for you. For example, if you are a plumber, a waterproof tool bag will be more useful for you than say, a plumber. Some tool bags come with extra features such as built-in cordless speakers, lights, or the best tool bag with wheels. If you want such features, keep in mind your other considerations, and go for it! A tool bag can be used as a carrying bag, a suitcase, a carry on, and a lot of other styles. For this versatility alone, tool bags are worth carrying around for many people. 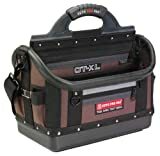 For example, the best tool bag for carpenter can come in a design that accommodates all his tools, while the bags for electricians or plumbers can be drastically different and versatile. While tool bags are very lightweight, most of its alternatives, such as tool boxes and containers, come in bulk sizes and add extra weight. Tool bags can free you from this extra weight, making sure you only carry your tools, not the weight of another bag along with it. While many tools carrying solutions offer compartments, tool bags take that up a notch with pouches, pockets, compartments, and what not. You can easily get rid of the mess tools make by using a tool bag’s compartments properly. Many small and sensitive tools can be ruined if kept in a sturdy storage or without proper padding. Tool bags are great solutions for such items, making sure they are kept protected and secured. Most of the best tool bags are waterproof these days, meaning that your tools are free from rust and water damage as you carry them around with ease. Q: I am an electrician/ plumber/ carpenter. Can I buy a generic tool bag? A: The truth is that every tool bag targeted toward certain professionals comes with extra caveats. For example, the best tool bag for electricians may come with meter pockets, which has little to use for a plumber, right? A plumber should look for the best tool bag for plumbers, instead of a generic one. Q: How big should my tool bag be? A: There is no rule of thumb as to how your tool bag should be in size. However, it should hold your current tools with ease, and have some room for possible future tools as well. Q: What extra features should I look for in a tool bag? A: Waterproof tool bags are certainly a plus, especially if you work with plumbing or outdoors in general. Your bag should also come with both shoulder straps and carrying handles, both with padding if possible. Best tool bag with wheels is out there, as well as the ones without them. And pockets – lots of pockets, including big ones for power tools help a lot! Q: Does color matter for my tool bag? A: Since the best tool bags are usually used and run rugged, color matters very little. However, it helps if it comes with light reflector colors, especially for working at night. Q: Should I buy a tool bag or a tool box? Which is better? A: While a tool bag and a tool box offer pretty much the same storage option and organizing facility, tool bags are more portable, easy to carry around, and best for people who need to be on the go frequently. The first tool bag on our list is the Custom LeatherCraft 1539 Tool Carrier. It is a beast of a bag with more than 50 pockets to organize all your tools on the go. It is spill-proof, made out of polyester, and weighs only 4.6 pounds. It is the best tool bag for electricians, plumbers and carpenters alike – you can’t go wrong with the Custom LeatherCraft 1539 Tool Carrier. The VETO PRO PAC OT-XL Tool Bag can accommodate an astonishing 80 tools and gears in its 44 pockets and compartments. Its ergonomics impress too – with padded straps, handles, and a waterproof base. With heavy duty zippers and lots of space, this is an almost perfect bag for any handyman. 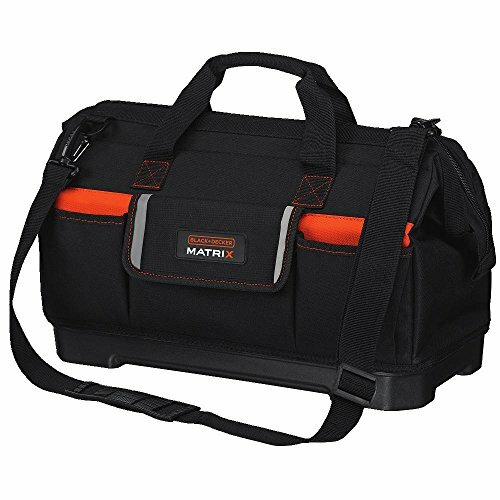 If you use the matrix system for storage, you will love the Matrixfrom one of the best tool bag brands – Black & Decker. Its wide opening, durable base made out of plastic, and rigid inside dividers make it an essential for transporting your Matrix and tools around. It is a best tool bag for plumbers, or any other professional out there. Made out of durable poly material, the Bucket Boss Gatemouth offers plenty of storage with 8 pockets of different styles and 16 loops. This tool tote can hold small tools with ease, while a rubber grip on the steel handle lets you carry it around with comfort. 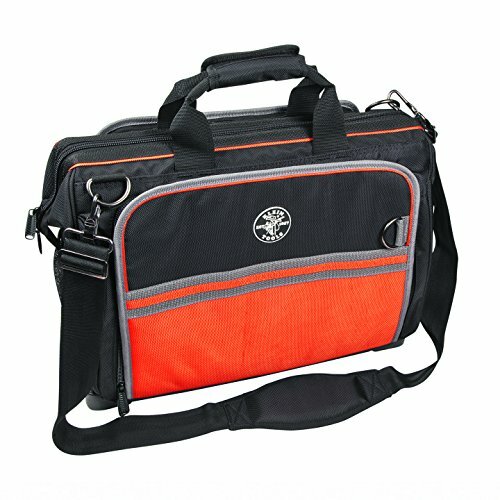 It is a best tool bag for electricians because of the design and storage options. The Tradesman from one of the best tool bag brands– DeWalt, can be summed up in two words – easy access. 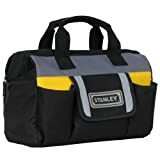 Unlike most other tool bags on this list, this one offers a no-nonsense, easy to access approach, complemented by plenty of storage. Features include 33 pockets in total, alongside a pop-open feature for larger compartments on the inside. The compact, highly portable Stanley Soft Side Stanley Soft Side is designed mainly for carrying hand tools, as well as smaller items. With its rubber foam and padded handles, you can carry around your pocket tool and personal items without any hassle. 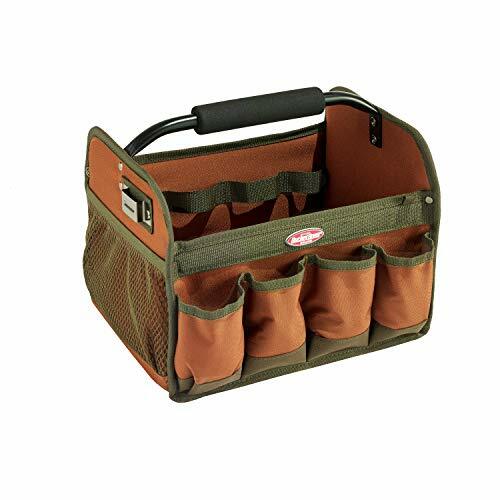 The Klein Tools 554181914 Electrician’s Bag is a mighty little storage option for carrying your tools around. With 55 pockets and a durable design, it is your ultimate storage solution for tools. And the lock bars for keeping the bag wide open don’t hurt either! There are very few tool bags that look as good as the Custom LeatherCraft Center Tray Tool Bag. 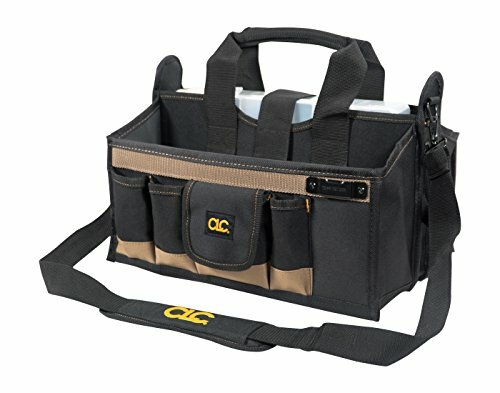 This multi-purpose bag can hold both your power tools, as well as smaller items in its 16-pocket organizer. The center pocket can accommodate just about any everyday power tool you can think of, and then some! DeWalt is one of the best tool bag brands when it comes to tool storage options, and its DG5543 16-Inch Tradesman’s Tool Bag certainly holds up that legacy. This 33-pocket organizer comes in the usual pop-open style, and is made out of heavy-duty fabric like all DeWalt tool bags. If you’re looking for a highly durable, heavy-duty tool bag, then the Bucket Boss Gatemouth should be the perfect fit for you. This tote bag comes with 8 pockets and 16 loops (elastic) for all your tool storage needs. With the bag, you also get the metal tape clip, while the grip is covered with foam-rubber for easily carrying around. As for our recommendation for the best tool bags, our top pick is the Klein Tools 554181914 Electrician’s Bag for its 55 pockets and a sturdy design. The lock bars and two separate meter pockets complement the bag further. The VETO PRO PAC OT-XL Tool Bag is another great choice as it can accommodate 80 tools and gears in 44 pockets and compartments. With padded straps, handles, and a waterproof base, heavy-duty zippers and lots of space, it is hard to ask for more from this bag! Tool bags are essential items for not only tradesmen and professionals, but for anyone who needs to carry tools and other items around. If you’re looking to buy one, we hope our guide helped in making up your mind. Pick some of the best tool bags from our list, and we assure that you won’t regret it.